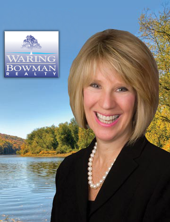 Bev Waring is a lifetime resident of the Pocono's. Residing in Shawnee with her husband Malcolm, who is also a REALTOR, she has a BA in Communications from Rosemont College in Rosemont, PA near Philadelphia. Designations include Certified Residential Specialist and Senior Real Estate Specialist. Whether you are searching for small get-away cottage or an estate Bev is ready, able and willing to help you with your needs. Communication plays a large role in her business ethic in that she will get back to you as quickly as possible, she will listen to what you are looking for and try to find it within your time frame. Bev is just great all around. She is what you always hope for in a Real Estate Professional. We had an idea what we wanted and within a short period of time she found it. She walked us through every step and made the process easy and pleasurable. We would recommend Bev to anyone that is looking to do anything in real estate in the area. Expect the best and you get the best from Bev! - surrfgotham Sold home in East Stroudsburg, PA.
We were so lucky to have found Bev! Her professionalism, friendliness, knowledge and responsiveness make her customer service second to none. We will surely recommend her to our friends and would use her in the future without hesitation. She made our experience wonderful and greatly reduced the stress and anxiety related to a home purchase. Completely satisfied and more! - ajoberiv, Showed home in Gouldsboro, Covington Township, PA.